On January 4th, 2006, His Highness Sheikh Mohammed bin Rashid Al Maktoum became the Ruler of Dubai following the death of Sheikh Maktoum bin Rashid Al Maktoum. On January 5th, the members of the Supreme Council elected Sheikh Mohammed the Vice President of the UAE. On February 11th, 2006 UAE President His Highness Sheikh Khalifa bin Zayed Al Nahyan nominated Sheikh Mohammed to become the Prime Minister of the UAE; the Council approved this nomination. Sheikh Mohammed and the members of his Cabinet took their oaths in front of Sheikh Khalifa at Al Bateen Palace in Abu Dhabi. Sheikh Mohammed embodies energetic and successful leadership. He is a man who has made promises and kept them; he has insisted on excellence and achieved nothing less; he has defined the role of leadership and fulfilled it. Since becoming the Vice President and Prime Minister of the UAE, and Ruler of Dubai, groundbreaking initiatives have been rolled out at an astonishing rate. On April 17th, 2007, Sheikh Mohammed unveiled the UAE Government Strategy Plan with the aim of achieving sustainable development throughout the country, investing federal resources more efficiently and ensuring due diligence, accountability and transparency across federal bodies. Regionally, his most outstanding achievement was the launch of the Mohammed Bin Rashid Al Maktoum Foundation, on May 19th, 2007, with an endowment of $10 billion. The foundation’s aim is to promote human development by investing in education and the development of knowledge in the region by cultivating future leaders in both the private and public sectors, promoting scientific research, spreading knowledge, encouraging business leadership, empowering youth, renewing the concept of culture, preserving heritage and promoting platforms of understanding among various cultures. 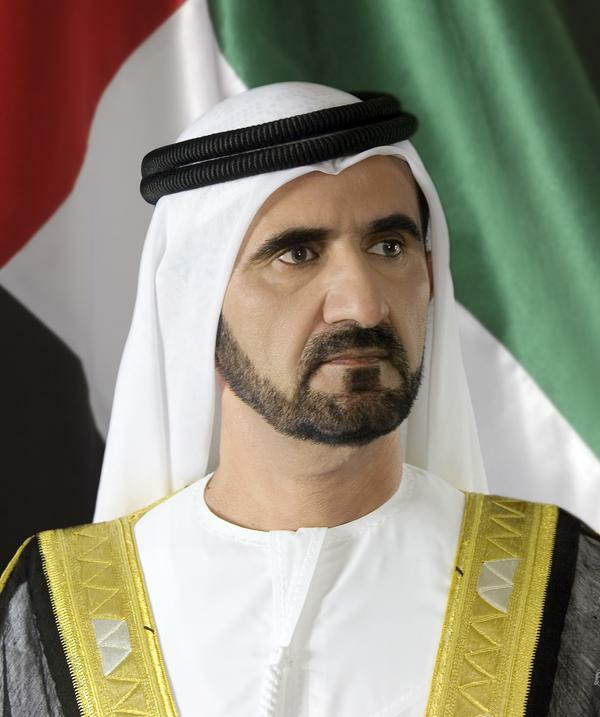 UAE Vice President, Prime Minister and Ruler of Dubai His Highness Sheikh Mohammed bin Rashid Al Maktoum was born in 1949. He is the third of Sheikh Rashid bin Saeed Al Maktoum’s four sons. Sheikh Maktoum, Sheikh Hamdan and Sheikh Ahmed are his brothers. Sheikh Mohammed enjoyed a happy and carefree early childhood in the Al Maktoum family’s home located in Al Shindagha. His parents and his grandfather, Sheikh Saeed, the Ruler of Dubai, doted on him and close family surrounded him. Sheikh Mohammed and his brothers found their natural playmates among their cousins and the children of Dubai’s major trading families, the sheikhdom’s equivalent of an aristocracy. He was an athletic and energetic child; an enthusiastic participant in traditional children’s games such as Luhol and Huwaim, better known as tag and hopscotch. Even as a toddler he liked nothing better than to kick a ball around the enclosed sandy courtyard of the house. Sheikh Saeed held his daily Majlis on wooden benches near the entrance to their Shindagha home. It was an informal affair, but a good learning environment and Sheikh Mohammed who was very close to his grandfather could often be found sitting alongside Sheikh Saeed. From an early age he was taught about hunting, especially the noble Arabian sport of falconry. Sheikh Mohammed has always found the intensity of the sport and the opportunity to return to his Arab roots and distance himself from the modern world a most attractive combination. In addition to hunting, the Maktoum brothers were taught the rudiments of horsemanship by their father. Sheikh Mohammed took to the saddle immediately. He and his close friends soon rode nearly every day. From the age of four, Sheikh Mohammed was privately tutored in Arabic and Islamic Studies. In 1955, he began his formal education at Al Ahmadiya School, a small primary school in Deira. It taught Arabic grammar, English, mathematics, geography and history. Thanks to his earlier tutoring, Sheikh Mohammed excelled. At the age of 10 he moved to Al Shaab School and two years later he went to Dubai Secondary School. On September 9, 1958, Sheikh Mohammed’s grandfather, Sheikh Saeed, passed away and his father became Ruler. From October 1958, Sheikh Rashid began serious preparations for his sons’ future in government. During the 1950s Sheikh Rashid had drawn the most talented individuals in the community into his immediate circle. There were bankers, builders, merchants and intellectuals. Sheikh Mohammed grew up as part of this unique group. He grew into a valuable participant, despite his relative youth. Thanks to an almost photographic memory, Sheikh Mohammed progressed quickly through Dubai Secondary School. At the end of the 1964/1965 academic year he easily passed exams in the main strands of the school’s curriculum. Already, Sheikh Rashid believed that, as Dubai developed, a man with a character such as Sheikh Mohammed’s would be best suited to managing the increasing external and internal security demands. With this in mind, Sheikh Rashid started looking at military training options for his third son. But first, the young prince needed a complete grounding in the English language. In August 1966, Sheikh Mohammed flew to London. He was accompanied by his cousin, Sheikh Mohammed bin Khalifa Al Maktoum. They enrolled in the Bell School of Languages, in Cambridge, one of Europe’s best-regarded language schools. Because of its international reputation, the Bell School of Languages attracted a wide range of nationalities. In Sheikh Mohammed’s classes there were many Chinese and Japanese students, a large number of Spanish and a smattering of others from North and South America, Australia and Africa. It was an intriguing melting pot of nationalities and cultures and Sheikh Mohammed used the opportunity to learn about many of his classmates and their countries. Sheikh Mohammed threw himself into the vibrant Cambridge student literature scene and integrated himself fully into the student life. Besides poetry, sports held great interest for him, particularly rowing. On Saturday May 5, 1967, he and Sheikh Hamdan attended their first horse race, and saw Royal Palace win the 2000 Guineas under Gary Moore. As Sheikh Mohammed entered his twenties, he had a good understanding of all the areas that would be of importance in his adult life: literature, sport, the military, and politics.